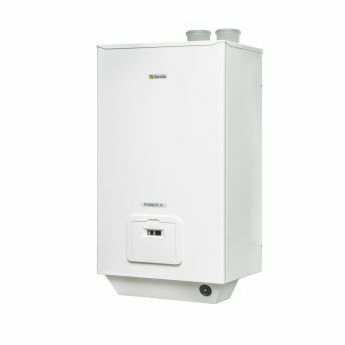 ■ Wall hung boiler for light commercial applications. ■ Bimetallic (stainless stell-copper) condensing heat exchanger. ■ Modulation ratio up to 1:6. ■ Low Energy modulating synchronous pump (ErP compliant - EEI ≤ 0.20), 7m head with anti-blocage cycles system. ■ Built-in 3 ways valve with anti-blockage cycles system (on the R.S.I. modules). ■ Built-in 12 lt expansion vessel (on 35 R.S.I. model). ■ Optional 12lt or 18lt expansion vessel kit allocating inside. ■ Management of three circuits: high temperature, low temperature and DHW tank. ■ Total pre-mix burner with low emission: Class 5 (UNI EN 483). ■ Possibility to directly connect a DHW tank via the built-in 3 ways valve (on R.S.I models) or via an external 3-ways valve (on 50 model). ■ Climatic thermoregulation as standard with outdoor probe (as option). ■ Electronic board with self-diagnostic function and frost protection.